How was your weekend? Mine flew past in the blink of an eye, and I can’t quite believe it’s Monday already! I know many of you in the US have a short week ahead due to American Thanksgiving, and if that’s the case, I hope you’ve got some fun (and tasty) celebrations ahead! 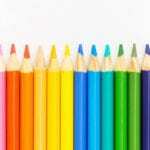 Today I want to geek out on post-workout recovery. 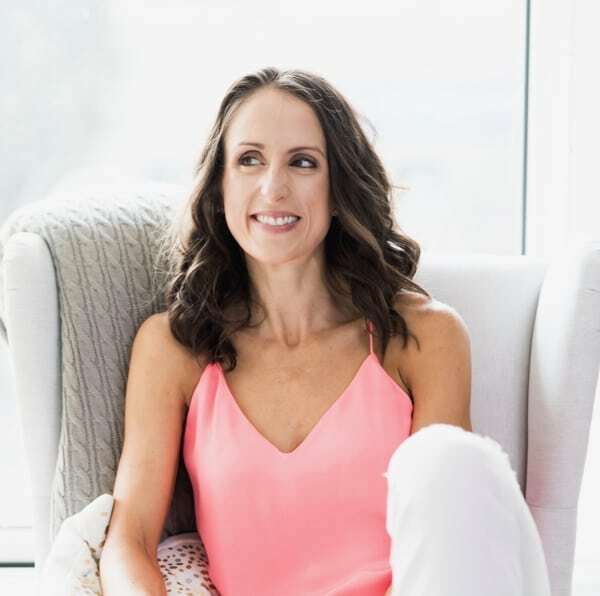 If you’re a nutrition nerd like me who likes to work up a good sweat on the regular, gather round – there’s some exciting news to be shared! As many of you know, I’m a big fan of Vega, especially the Sport line of products which I’ve used for several years to fuel my running and triathlon endeavours. 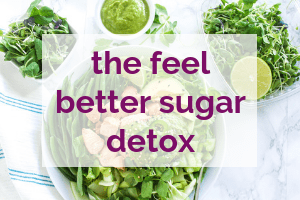 Vegan, gluten-free, soy free, and constantly being improved in order to improve effectiveness and taste – what’s not to love? 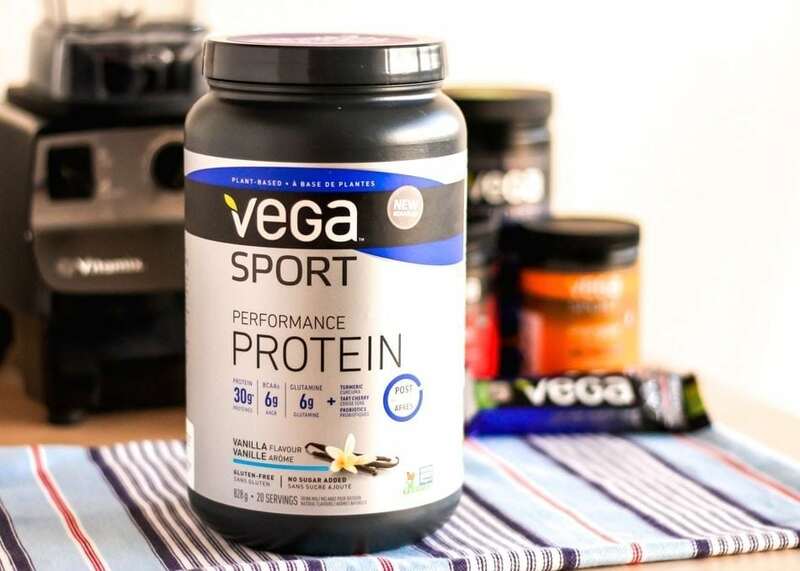 Very recently, Vega Sport Performance Protein got an amazing makeover, and now it’s got even MORE wonderful ingredients that are key to proper recovery. You’ve probably already heard that cherries are very nutrient-dense, but tart cherry juice is really where it’s at. It’s rich in flavonoids called anthocyanins which have super strong anti-inflammatory and antioxidant properties – even more anti-oxidant superpowers than dark chocolate! Not just for curry! This vibrant-yellow root is another amazing food for post-workout recovery, thanks to the active ingredient curcumin which gives it such a bright colour. 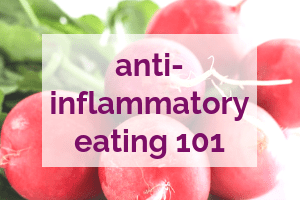 Not only is turmeric an anti-inflammatory like tart cherry, but when eaten its compounds go on a search mission throughout your body for damaging free radicals and destroys them. Pretty cool, right? You might recognize this as the enzyme in pineapple, and if so, you’re right! 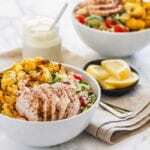 Bromelain is a perfect add-in to a post-workout meal because it helps us to digest protein. So with all that said, and given my sky-high level of excitement about these changes, you can bet I’ve been working Vega Sport into as many smoothies as possible lately. On the weekend I made a vegan Egg Nog Smoothie, and oooooooohhhhhh-emmmmm-GEEEEEE… GUYS. You’ve gotta try this one. If you’re not yet in the festive mood, this will most certainly push you over the edge. Place all ingredients except ice in a blender and blend until smooth. Add ice as needed to thicken, and continue blending until no chunks remain. Pour into a glass and garnish with a sprinkle of cinnamon and cinnamon stick. 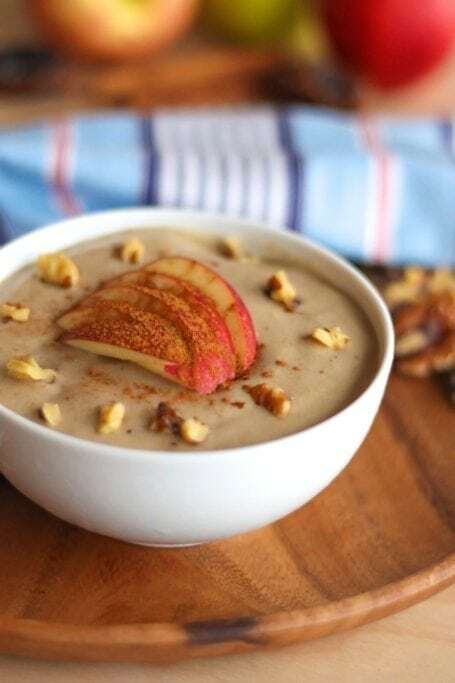 Walnut Caramel Apple Smoothie Bowl – Just like a gooey, juicy caramel apple coated in walnut bits, minus the struggle to eat off a stick. I like a nice tart Honeycrisp apple in this recipe, but feel free to use your favourite kind. 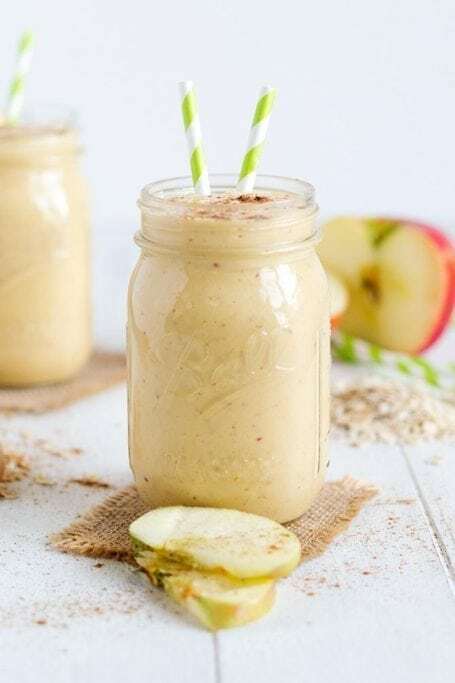 Caramel Pear Oatmeal Crisp Smoothie – via Cotter Crunch. Pears have got to be one of the most underrated, forgotten-about, but totally juicy and delicious cool-weather fruits in the grocery store these days. I love Lindsay’s take on this decadent dessert alternative. 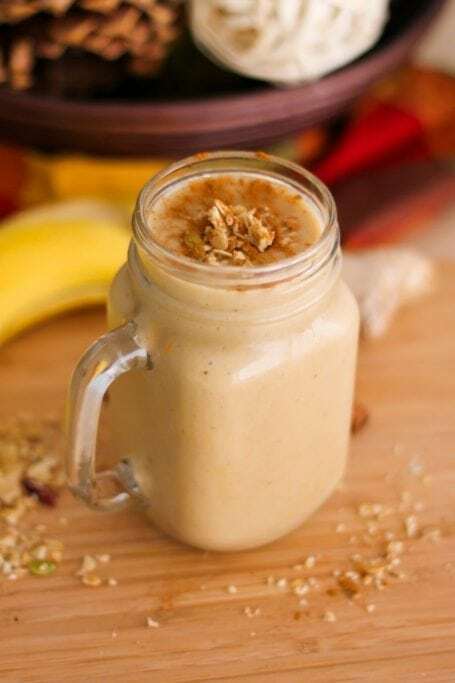 Banana Bread Smoothie – Another nutty dessert in smoothie form, this one can be dressed up with your favourite granola or a handful of nuts – or both! 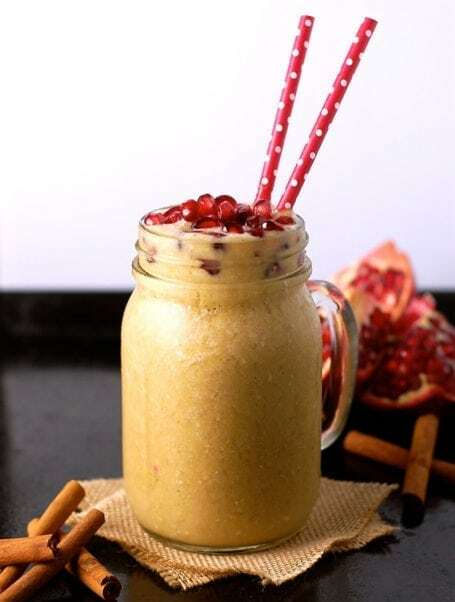 Butternut Squash Pomegranate Smoothie – via Turnip the Oven. Have you tried squash in your smoothies yet? If not, you’ve gotta get on it stat. 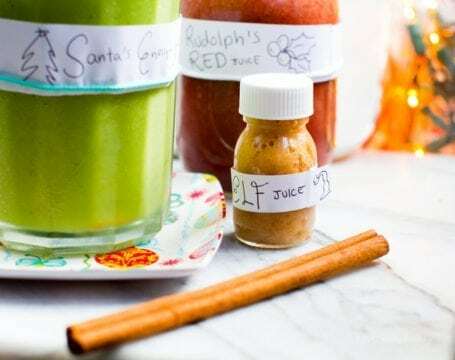 I love the festive look of this smoothie and knowing it’s loaded with vitamins A B, and much0s-antioxidants makes me even more excited to slurp it back. 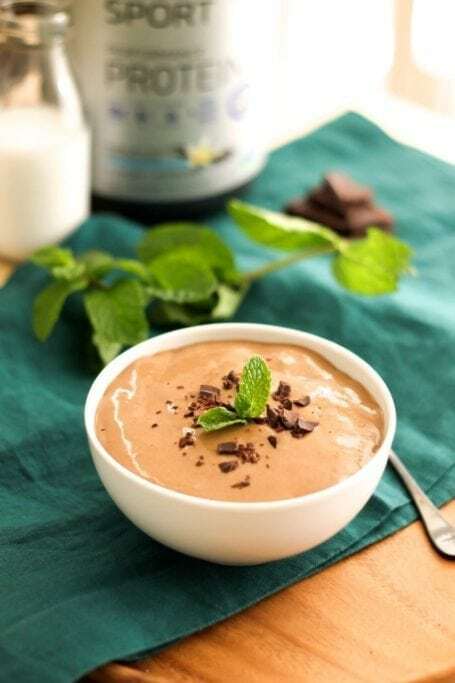 After Eight Smoothie – or peppermint patty, or whatever you prefer to call mint chocolate! After Eights are a post-dinner treat I remember from my childhood, and this smoothie delivers the same taste in healthy liquid form. 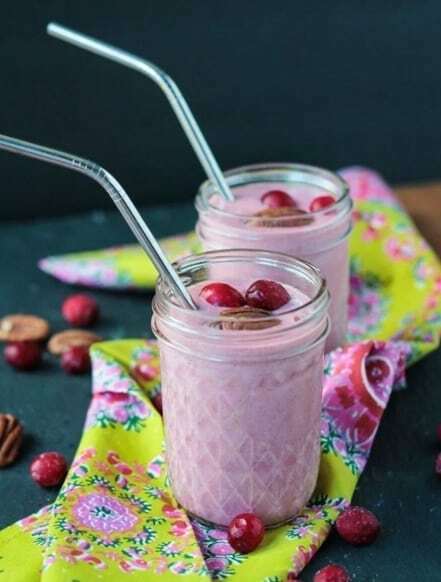 Cranberry Smoothie – via Veggie Inspired Journey. Got leftover cranberry sauce to use up? This smoothie is the perfect way to do it. Jenn’s super simple smoothie needs only 4 ingredients – that’s it! Gingerbread Man Smoothie – I probably don’t need to persuade you to eat something that tastes like a warm spiced gingerbread man cookie, but if you’re iron-deficient, here’s just one reason: This recipe is naturally sweetened with blackstrap molasses, and just 2 tbsp of the stuff provides about 13% of the average daily recommended intake – plus a bunch of trace minerals like copper, calcium and magnesium. Vegan Chai Spiced Smoothie Bowls – via Cotter Crunch. 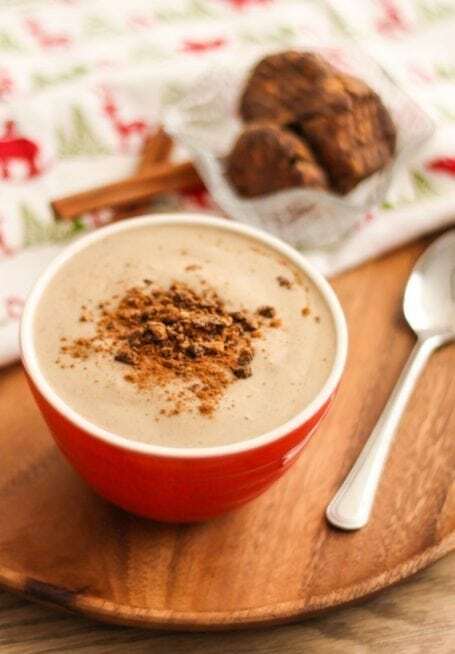 To me, cinnamon and all the other spices in a good chai blend are a must-have during the winter. 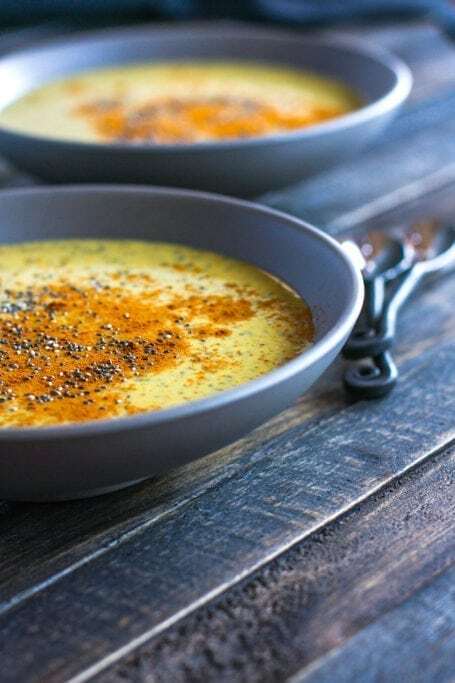 Lindsay’s smoothie bowls contain turmeric (see, I told you it was great stuff!) as well as some great healthy fat sources like coconut milk, chia seeds and almond butter to keep you full for hours. 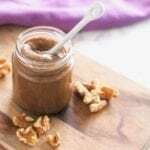 Chocolate Maca Hazelnut Smoothie – The chocolate hazelnut combo in this recipe reminds me a bit of Nutella or Ferrero Rocher chocolates, and stress-busting maca takes the nutty flavour up another notch. 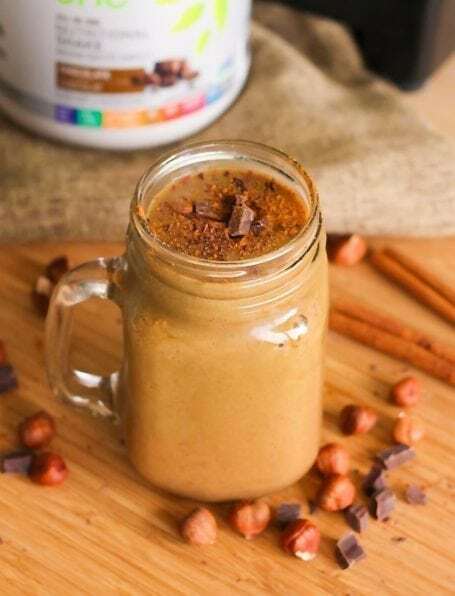 Pumpkin Spice Protein Shake – via Go Dairy Free. 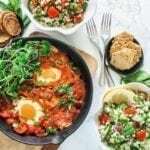 Alisa is a kitchen goddess and SUCH a great resource for anyone looking to transition to or maintain a dairy-free diet. 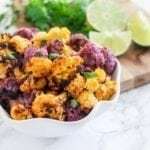 She’s got some great things going on in this recipe, and also provides a few suggestions if you prefer not to use bananas. 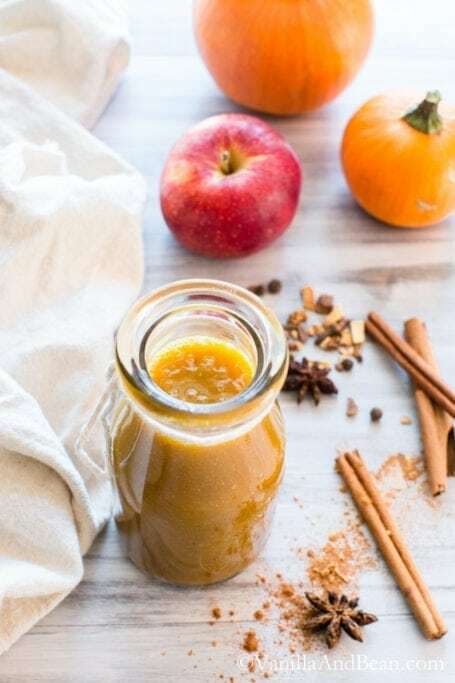 Autumn Spice Smoothie – Vanilla and Bean. I was sold the second I saw those little anise stars in Traci’s shot below. This smoothie has a really unique cider and rooibos tea base going on, and that’s great news if you’re tired of using milk or nut milks all the time! 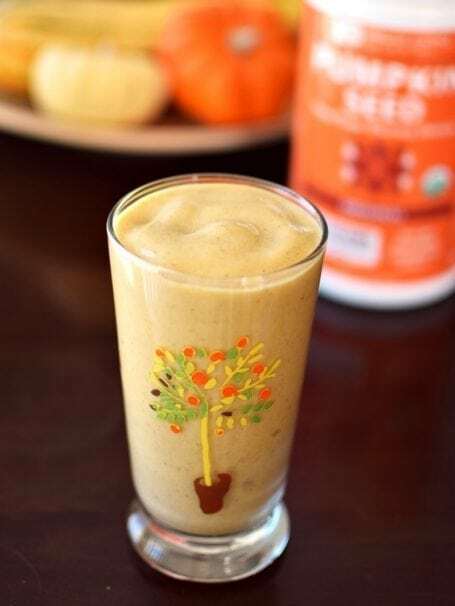 Pumpkin Pie Smoothie – Veggie Inspired Journey. 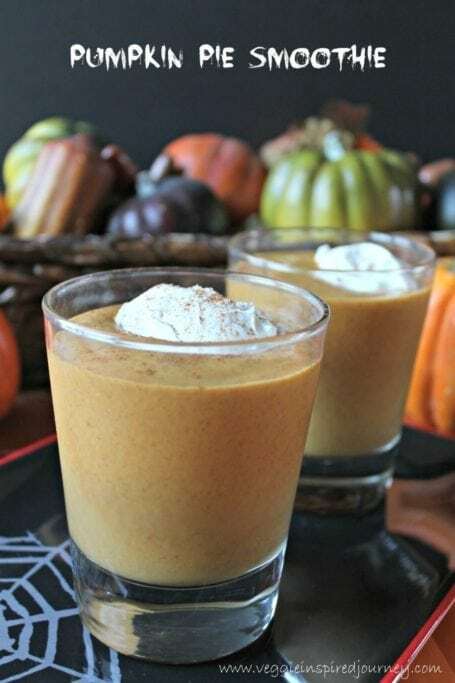 You can never have too many pumpkin pie smoothies. 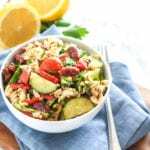 This one from Jenn is super simple and includes pecans which are currently having a moment in my kitchen. Sign me up for pecan in ALL the things! 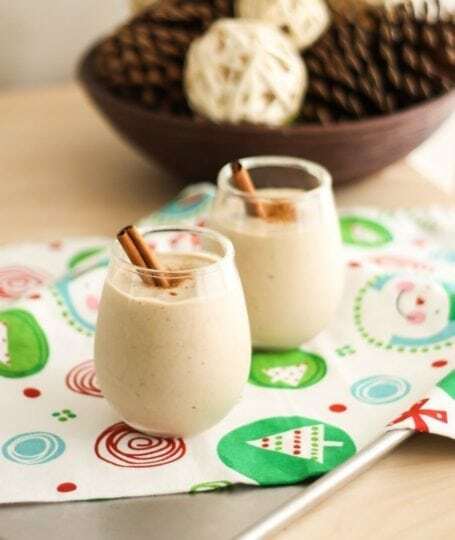 Do you have any healthy holiday smoothie blends to share? Feel free to link up below! Have you tried the new Vega Sport Performance Protein yet? What did you think? Thanks Heidi! I hope you enjoy trying a few! This is Perfect! I came here specifically to look for a smoothie recipe. Thanks so much! WOW – Smoothie overload and I love it. I am boring and often drink the same old smoothie day after day. You have totally inspired me to switch it up! Trust me lady, you would love the chocolate hazelnut one!! Thanks Heather! And speaking of chocolate maca, are you a big fan of Vega’s Maca Chocolate Bars too? I can’t get enough – they’re SO good and make such a great smoothie topping when chopped up! 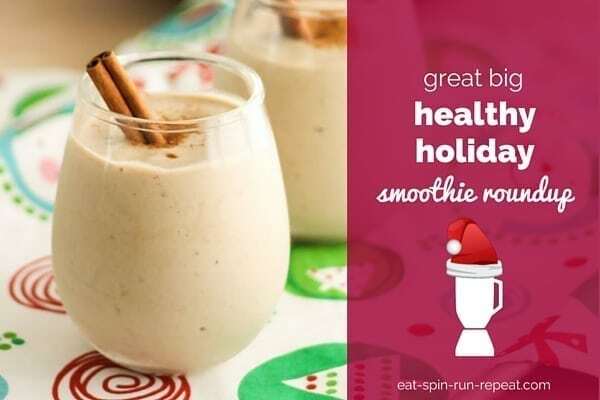 Great big holiday smoothie roundup is right! I will have one of each of these please – all hand delivered by adorable little cats dressed in elf costumes. Wow! that is a wonderful line up and the eggnog smoothie takes the cake <3 it. I am going to book mark this page as I am a smoothie snob. Hehe you’re welcome! I know right, the ‘r’ often gets forgotten! Is there a substitute for the almond butter in that first smoothie recipe?? You could use any nut butter you like really, or just throw in a handful of almonds! 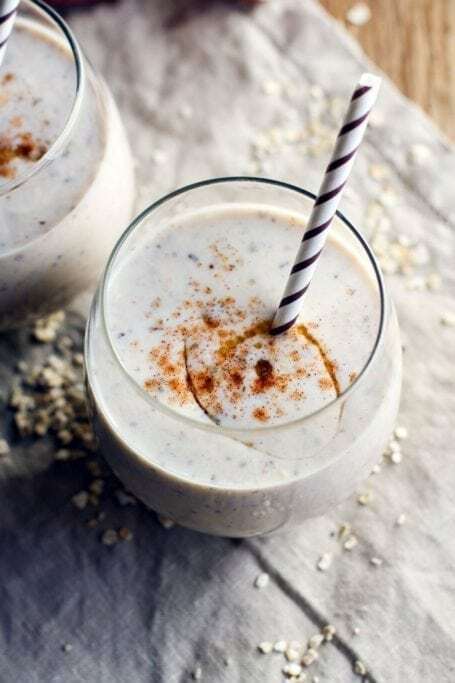 I find almond butter gives the smoothie a little bit of healthy fat content (and therefore more staying power – you’re not hungry an hour later!) without a super nutty taste. 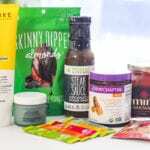 I think cashew butter would taste fantastic, or even a little coconut oil if you’re looking to replace the fat source. Hope that helps! 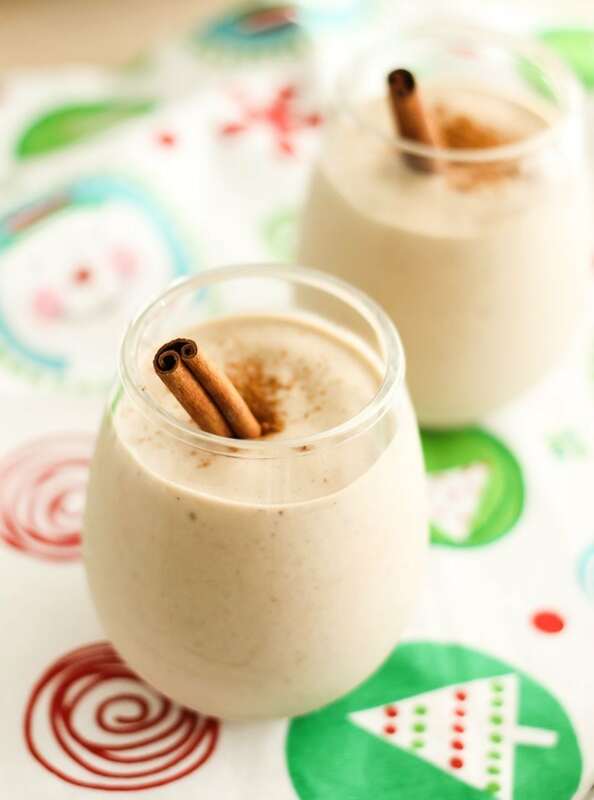 I’m SO making that eggnog smoothie and definitely sharing this post now! Thank you for including me! These look great! I am excited to try some of these this weekend! Sounds good Emma! Would love to hear which ones you like best! 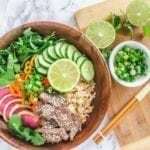 We also recently published a lot of healthy smoothie recipes at Healthsomeness at the beginning of this month, if you have a minute check them out!